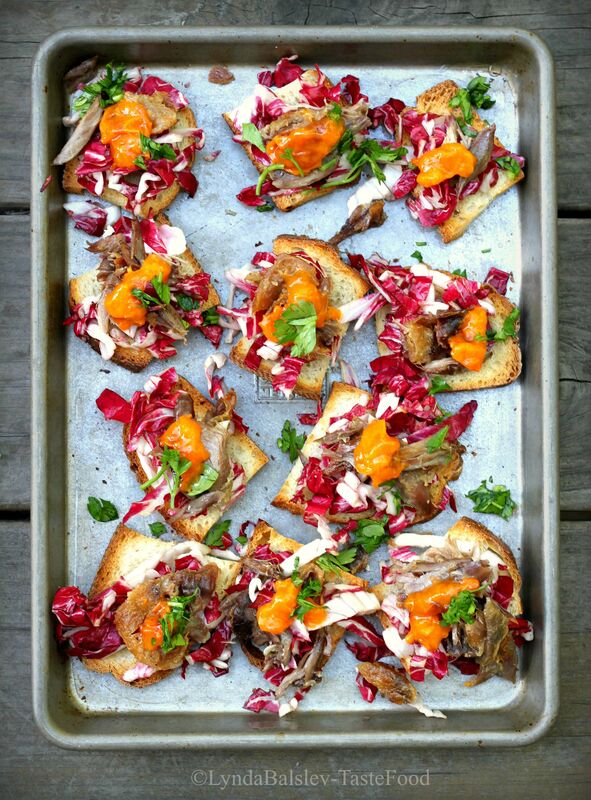 Messy is ok sometimes – especially when you are heaping lots of delectables onto crisp crostini. In such the case it’s inevitable that some of the ingredients will tumble onto the plate, creating random ‘garnishes’. This is when the term rustic comes in handy. Rustic implies comfort and nothing too fancy, with an emphasis on adjectives such as finger-licking and delicious. Or at least that’s how it works here. Crostini are a fun way to present a light and casual meal. 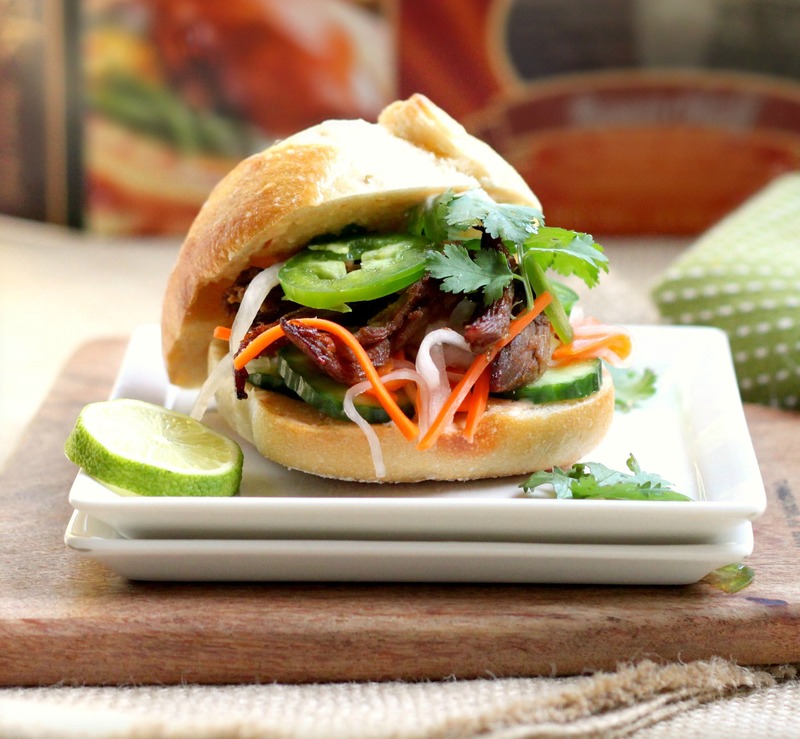 They are also a great way to showcase simple fresh ingredients and use up interesting leftovers. For this recipe I used duck meat that was leftover from my current cookbook project. I shredded the leg meat and quickly caramelized it in the oven, then mounded it over the toasts. While chances are you may not have leftover duck loitering in the back of your fridge, duck legs can usually be found at your local market or butcher. Otherwise, shredded pork is a great substitute. The point is to have a little fun building your crostini, and try to be creative with what you’ve got. And it’s ok if they are messy – just call them rustic. 1. Combine the radicchio slaw ingredients in a bowl and stir to combine. Let stand at room temperature for at least 30 minutes. 2. Heat the oven to 375°F. Brush the apricots with oil and lightly season with salt and pepper. Place in a baking dish and bake, skin-side down, until the flesh is soft, about 10 minutes. Remove and cool; do not turn off the oven. 3. Arrange the bread slices in one layer on a baking tray. Brush the bread with the olive oil and lightly season with salt. Bake in the oven until golden and crisp, 8 to 10 minutes. Remove and cool. 4. Turn on the oven broiler. Combine the duck ingredients in a bowl and stir to combine. Spread in a baking dish and broil until brown and beginning to crisp in parts, 3 to 4 minutes, stirring once. 6. Drain the radicchio. 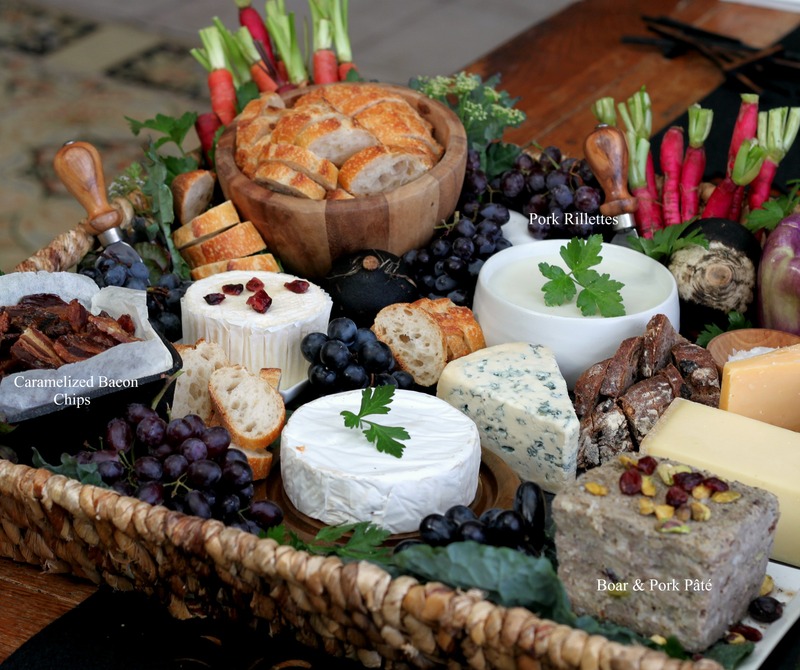 Arrange the bread on a serving platter. Mound some of the radicchio over each bread slice. Top with a few pieces of duck and a small dollop of apricot flesh. Garnish with parsley and additional salt and pepper. Serve immediately. 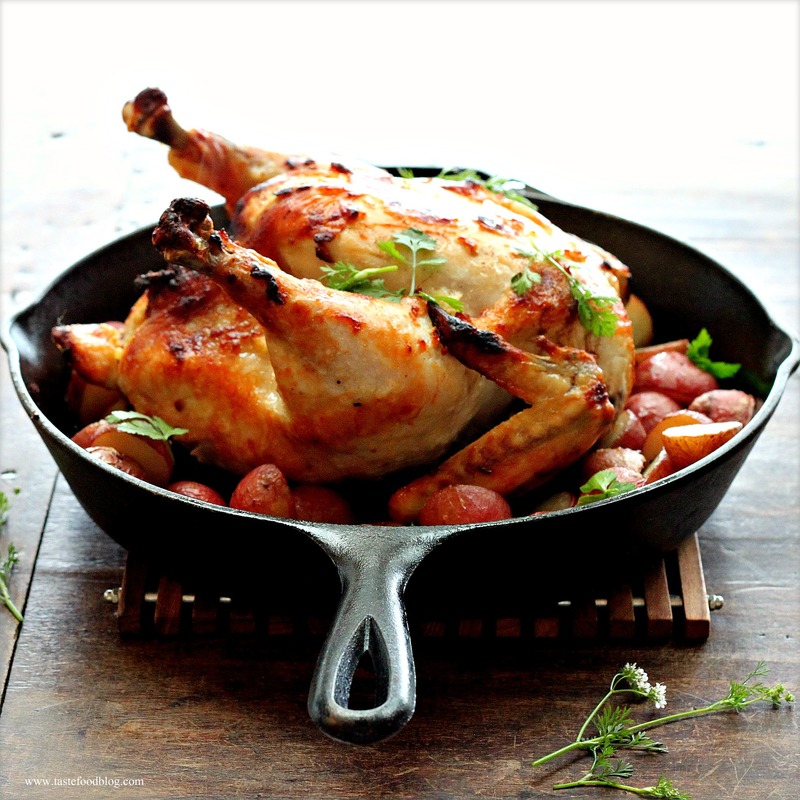 If you are wishing for an easy and rewarding rustic dinner then look no further than this roast chicken. A whole roasted chicken is a weeknight wonder, yielding a bounty of food with little effort. It will fill your home with comforting and tantalizing aromas as it cooks, amply feed a family of 4 with leftovers for lunch, and bestow you with the goods for a rich and restorative stock. I roast a chicken nearly weekly in our home. For variety, it’s easy to change it up with a rub or marinade depending on the mood or season. Feeling spicy? Then try a marinade with Sriracha and serve over a bed of couscous. Prefer something cozy and traditional for a grey and rainy day? Then keep it simple with olive oil, rosemary, thyme and a pan gravy. If you are in the mood for exotic spice and aroma, like I was the other day, then try this recipe which infuses the bird with yogurt, lemon, garlic and ginger. Prepare the potatoes: Toss the potatoes, olive oil, paprika and salt in a bowl. Scatter around the chicken. Place the pan in the oven. Bake for 30 minutes. Remove from oven. Using tongs, carefully turn the chicken over, breast-side down. Stir the potatoes. Return to oven and bake for 20 minutes. Remove and once again turn the chicken over, breast-side up. Return to oven and cook until chicken is thoroughly cooked and thigh juices run clear when pierced with a knife, about 20 minutes. Remove from oven. Transfer chicken to a cutting board. Tent with foil and let rest 10 to 15 minutes before carving. While the chicken is resting, return potatoes to oven to keep warm. Carve the chicken and return to skillet, nestling the meat between the potatoes in the pan juices. On the first day of the new year I make a stew. There are many reasons why I do this. Stews and braises are healthy and fortifying, a comforting antidote to holiday menus and festivities. Stews are reflective, incorporating humble ingredients with heat and time, yielding deeply flavorful results. Stews comfort and nourish us, while warming us on a cold winter day. This year I received a beautiful French oven for a gift, so I have another reason to make a delicious stew today. The chicken skin remains exposed while the chicken braises to maintain the color and crispness of its skin. Serves 4. Preheat the oven to 350°F. Season the chicken breasts all over with salt and pepper. Heat 1 tablespoon olive oil in an ovenproof pot or deep skillet over medium-high heat. Add the chicken, skin side down, in batches. Cook until the skin is brown and crispy, 4 to 5 minutes, then turn the chicken and cook 2 minutes. Transfer to a plate and repeat with remaining chicken. Drain off all but 1 tablespoon fat from the pot and add 1 tablespoon oil. Add the leeks to the pot and saute over medium heat, about 1 minute. Add the carrots, mushrooms and garlic. Saute over medium heat until the vegetables begin to soften and brighten in color, 3 to 4 minutes. Add the white wine and bring to a boil, scraping up any brown bits in pan. Add the bay leaf and thyme. 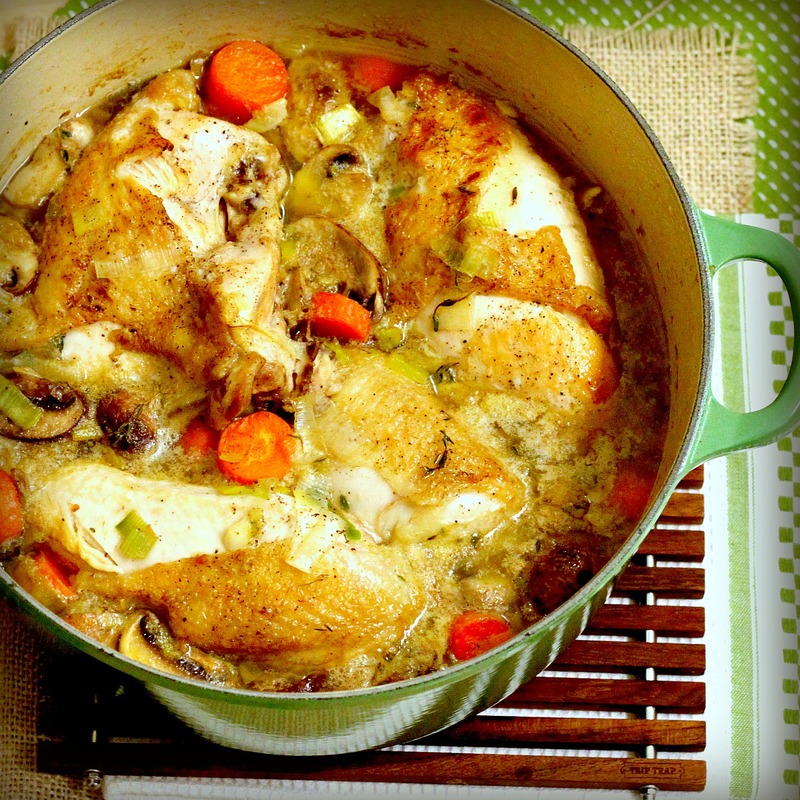 Return the chicken to the pot and nestle, skin-side up, into the vegetables. Pour in enough chicken stock, without splashing the skin, to nearly cover the chicken but not submerge it. The skin should remain exposed. Bring to a simmer. Cover and cook over low heat for 10 minutes. Uncover pot and transfer to oven. Bake until the chicken is cooked through, about 25 minutes. 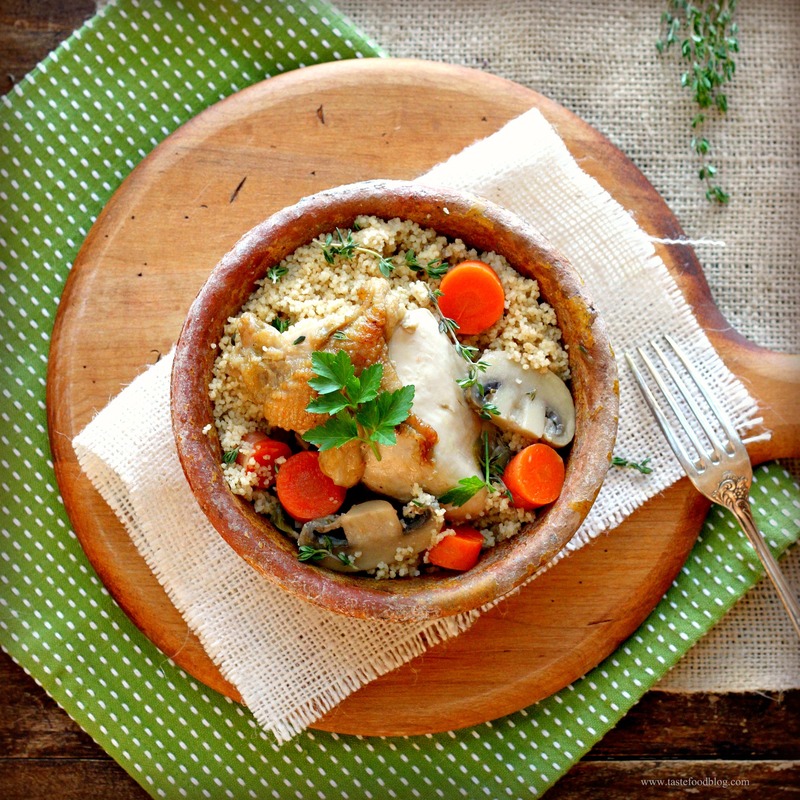 Serve in bowls with rice, farro or couscous. But this is the finale, so something more substantial and celebratory than a charcuterie board is in order. December is holiday season, and nothing speaks more to our Danish family than duck at Christmas. 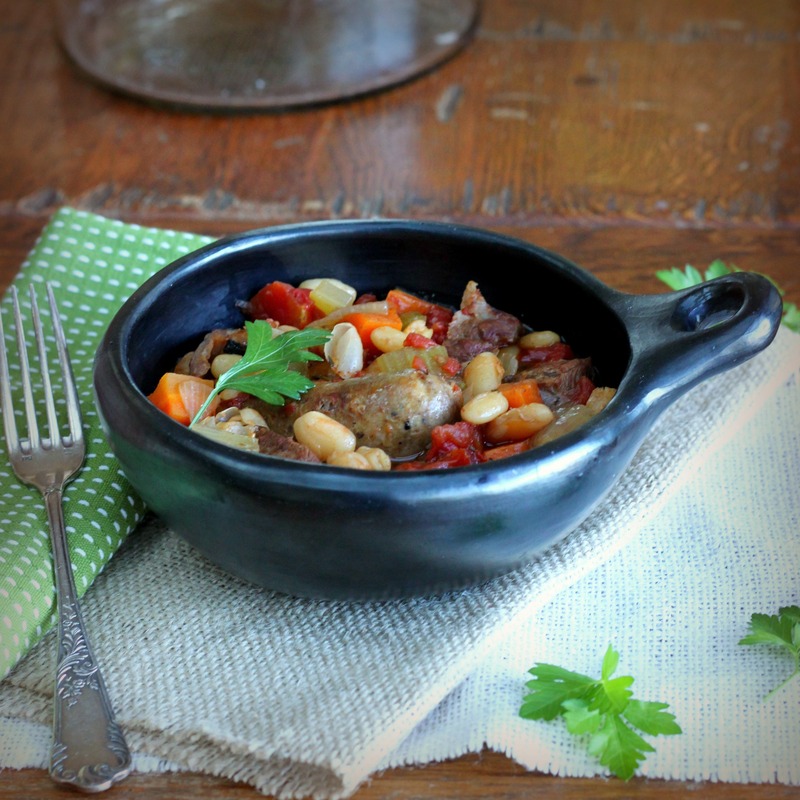 And what better way to celebrate duck than with a cassoulet – a French white bean stew brimming with duck leg confit, sausage and bacon. This version is not an authentic cassoulet, as I had to use whatever homemade charcuterie I had in the freezer or could make on short notice. 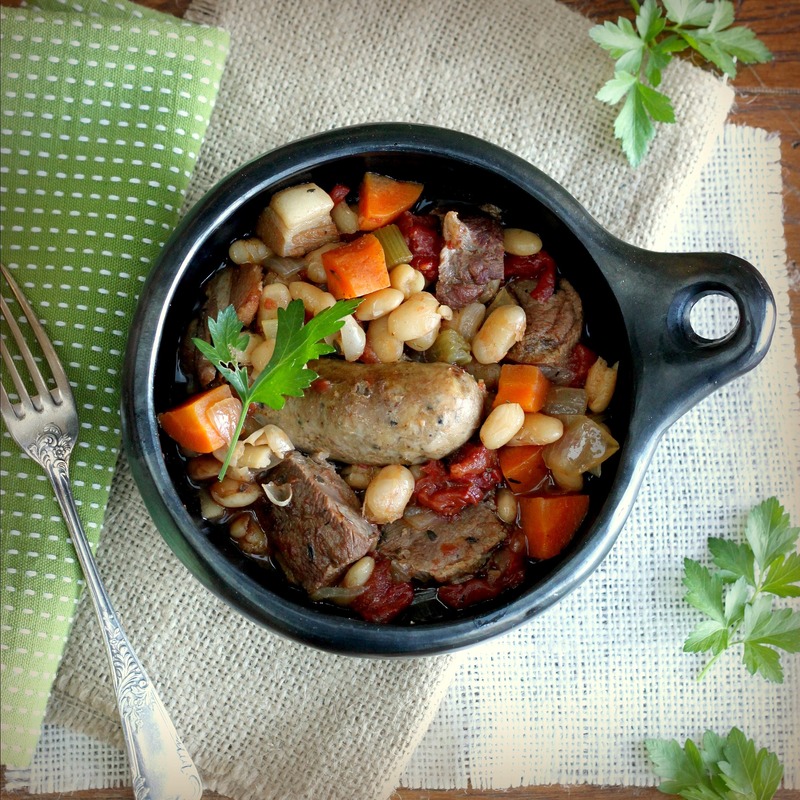 So, I am calling it a Charcutepalooza Cassoulet – or a Duck, Sausage and White Bean Stew. Start with uncooked white beans for best results – canned beans will turn mushy. If you don’t have access to duck confit, then substitute with an additional pound of duck breast. Serves 6. 1. Bring the beans and 4 cups (1 liter) of water to a boil. Remove from the heat, cover the pot, and let stand for one hour. Drain. 2. Heat the oven to 325°F. 3. Heat the olive oil in a large oven-proof pot with lid or a Dutch oven over medium-high heat. Add the sausage and brown on all sides. Transfer to a cutting board and do not discard the fat from the pan. Add the duck breasts in batches, if necessary, without overcrowding the pan. Brown on both sides and transfer to the cutting board. When cool enough to handle, halve each sausage, cross-wise and cut the duck breasts into 2-inch chunks. 5. Cover the pot and transfer to the oven. Cook until the beans are tender, about 2 hours. Remove from the oven and stir in the duck confit. Return the pot to the oven and cook, partially covered, for an additional 1 hour. My inspiration for making soup is often a convergence of too many veggies in the refrigerator with homemade stock and leftovers from a roast chicken. Such was the case after a weekend of house guests and dinners involving carnitas, black bean salsa, lots of corn and the aforementioned roast chicken. This recipe is not an authentic tortilla soup, as I managed to empty most of the contents of my veggie drawer into it. 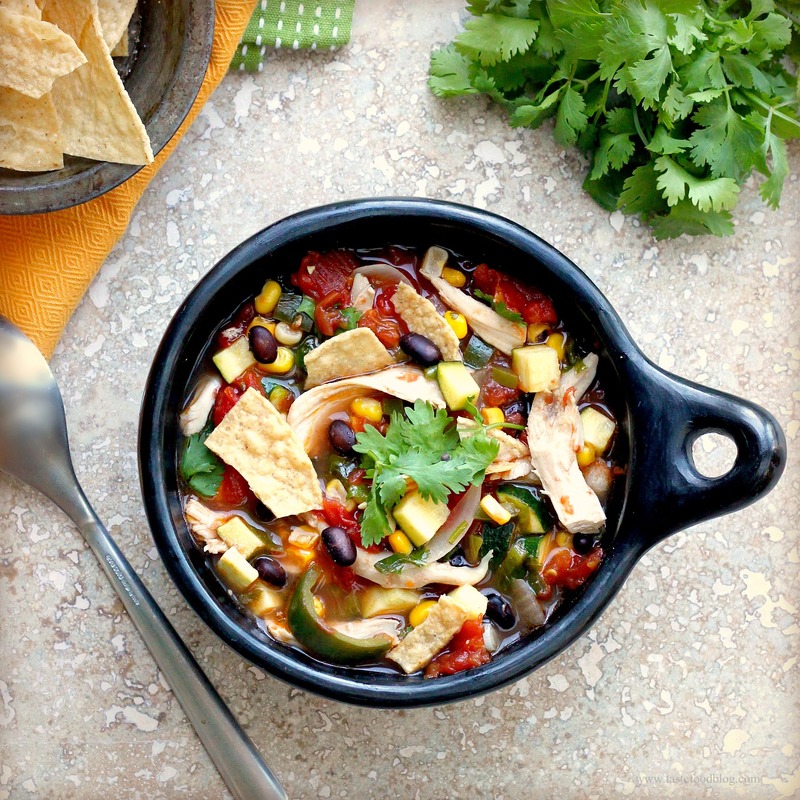 It’s chock-a-block full of corn, beans, zucchini and peppers, which led me to call it a Harvest Chicken Tortilla Soup. Heat the oil in a soup pot over medium heat. Add the onion and sauté until softened, about 2 minutes. Add the peppers and continue to sauté 2 minutes. Stir in the garlic and zucchini and sauté briefly, about 1 minute. Add the chicken stock, plum tomatoes with juice, tomato paste, cumin, coriander, salt, pepper, cayenne, and cloves. Bring to a boil, then reduce the heat and simmer partially covered, about 20 minutes. Stir in the corn, beans, and chicken and simmer until piping hot. Taste and adjust the seasoning if desired. Stir in the cilantro leaves and ladle into bowls. Serve garnished with the tortilla chips.